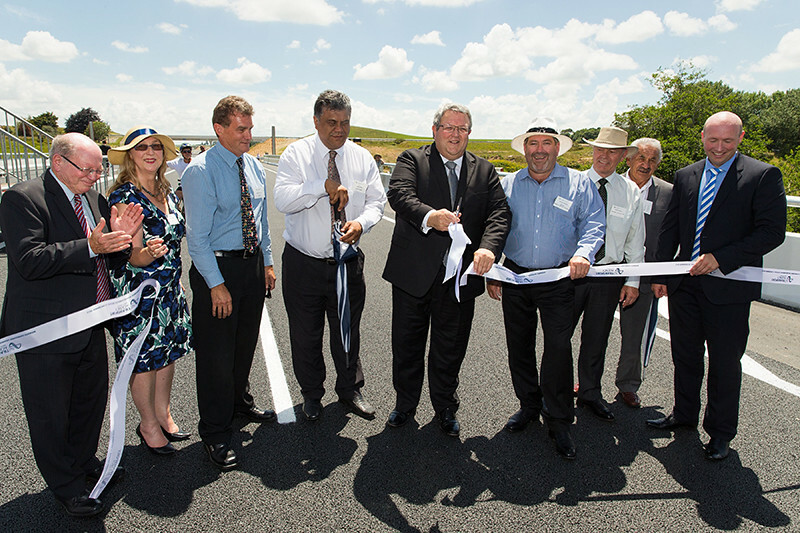 The 12.3km Ngāruawāhia section of the Waikato Expressway opened in December 2013. The four-lane road runs from Taupiri in the north, crossing flat farmland and the Waikato River before connecting with the completed Te Rapa section. When complete the Waikato Expressway will be the key strategic transport corridor for the Waikato region, connecting Auckland to the agricultural and business centres of Waikato and Bay of Plenty. The expressway will improve economic growth and productivity through more efficient movement of people and freight. increasing the highway's capacity and passing opportunities. The Waikato Expressway will be 102km in length running from the Bombay Hills to south of Cambridge. It will provide for two lanes of traffic in each direction divided by a central median, with local roads and interchanges generally serviced by bridges and underpasses. until the Huntly section is completed, part of the SH1B (Gordonton Road) has been upgraded to connect the existing SH1 with the Ngāruawāhia section. 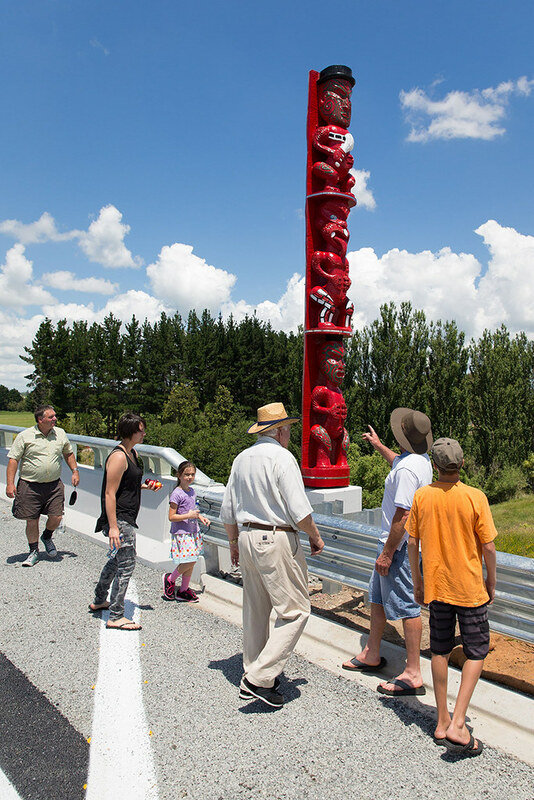 In 2010 the Taupiri Link project was split out of the Ngaruawahia section to address safety concerns at the intersection of SH1 and SH1B. Construction started on the Taupiri Link in November 2010 with the project opening in November 2011.The Taupiri Link provides the northern connection to the Ngaruawahia section of the expressway, until the Huntly section is built. The first stage, project investigation, was undertaken by Opus International Consultants for the NZ Transport Agency (then known as Transit New Zealand) between 1995 and 1999. This stage led to the Ngāruawāhia section being designated in the Waikato District Plan in 2002. That process was fully notified with submissions called for and a hearing by independent commissioners. Reviewing of the preliminary design of the alignment that formed the basis of the designation, including reassessment against latest Transport Agency objectives and against latest safety and environmental standards, as well as a review of intersection forms. Undertaking more detailed geotechnical, engineering and environmental investigations to confirm the alignment, the amount of land required for it and what works will be required to meet conditions imposed on the designation. Securing resource consents required for construction earthworks, stream crossings, stormwater drainage etc. Developing the design and project documentation to the point where a construction contract can be tendered. The third stage, detailed design and construction, followed the announcement to award the contract to Fletcher Construction in March 2011. The section was opened to traffic in late 2013. A finer grade of seal will be placed on the road later in 2014. The main four-lane expressway section starts at Gordonton Road, where a full diamond interchange was constructed as part of the Huntly section. The Expressway heads south across flat farmland, crossing Lake Road where it meets the future Hamilton section, before curving to the right and crossing River Road and the Waikato River before connecting to the Te Rapa section near Horotiu. The Expressway connects to the local road network at Gordonton Road to the north, where it will connect to the Huntly section, and it connects to the Te Rapa section in the south. In parallel with the investigations, the NZ Transport Agency and its consultant Bloxam Burnett and Olliver, consulted landowners, tangata whenua, stakeholders and other affected parties to ensure that any issues were considered. The consultation process included a combination of site visits, individual meetings and information days. Monitoring of noise during construction and advance notification of any unavoidably noisy construction activity. Haul routes for moving materials will be away from main roads and sensitive residential areas wherever practicable. Buffer zones and noise barriers to protect local residents, businesses and sensitive areas from road noise. Careful consideration was given to wildlife and habitats, in order to minimise impact and disruption. Landscaping and planting have been used to mitigate the visual impacts of the new road. Culverts, swale drains and wetland areas were used to manage natural water flows and drainage. Extensive planting was done around Lake Areare in conjunction with stakeholders. 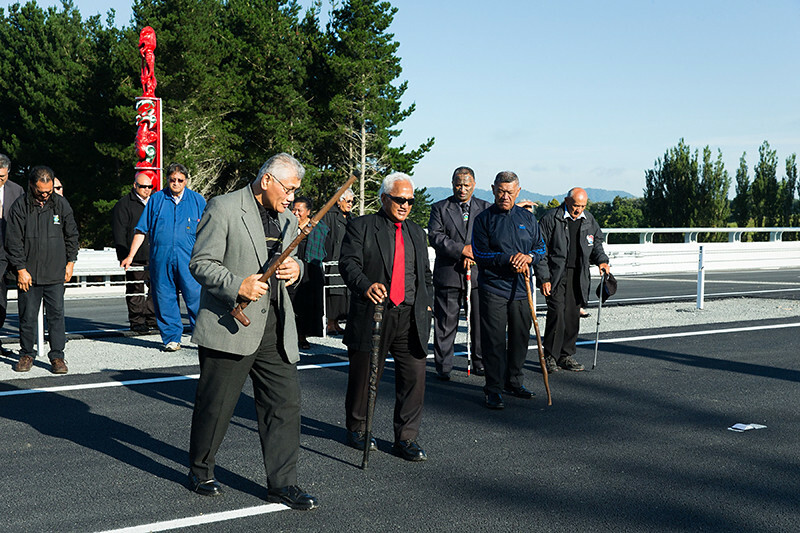 Protocols and agreements with local tangata whenua. Engagement of cultural heritage monitors. Liaison with local historical groups. On site archaeological controls to ensure that approved processes were followed.